Let me tell you my wondrous story of how I came to make these wonderful dolls. One day I discovered a book with photos of old dolls in a bookstore. I browsed through it and suddenly a face looked at me which was deeply familiar to me. 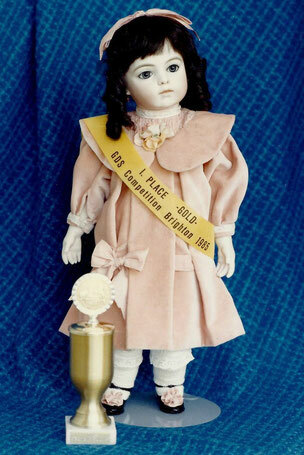 The text read that this was a doll of the company Bru from Paris Anno 1880. Back home again, I could not stop thinking of this beautiful doll face. The same night I dreamt I was in an old factory in Paris and was working as a doll painter together with many others workers at a long table. I saw many heads of these beautiful dolls lying there on the table and I was one of these painters. Because of this dream I began searching for these dolls. One day I heard that there was a workshop in Germany where you can learn to manufacture porcelain dolls yourself. I was very excited and joined the workshop. I came back home with two self-made baby dolls, which was in 1981. I was truly enthusiastic about that. I imported porcelain and doll molds from the United States, bought a furnace and went to work with passion. Day and night I worked obsessively. In 1985 finally I succeeded in making a Bru which was really looking like an old original, with leather body and brown paperweight eyes. I was so happy then! Mr. Vaclav Sladky, owner of the Vienna doll museum, who helped me with words and deeds throughout the years, told me that there was a world doll congress in Brighton, Great Britain. All my friends urged me to go there. I wrapped my first Bru doll made of white biscuit porcelain into a towel and flew to the world doll congress in Brighton. I timidly submitted my doll for the competition. The day of the prize ceremony I was very excited. There were more than 450 competitors from all over the world and my heart was beating wildly. When the winner was announced my knees got weak and with the last ounce of my strength I climbed the winner´s rostrum: there I received the first prize for my Bru doll! This was one of the most exciting experiences of my life!